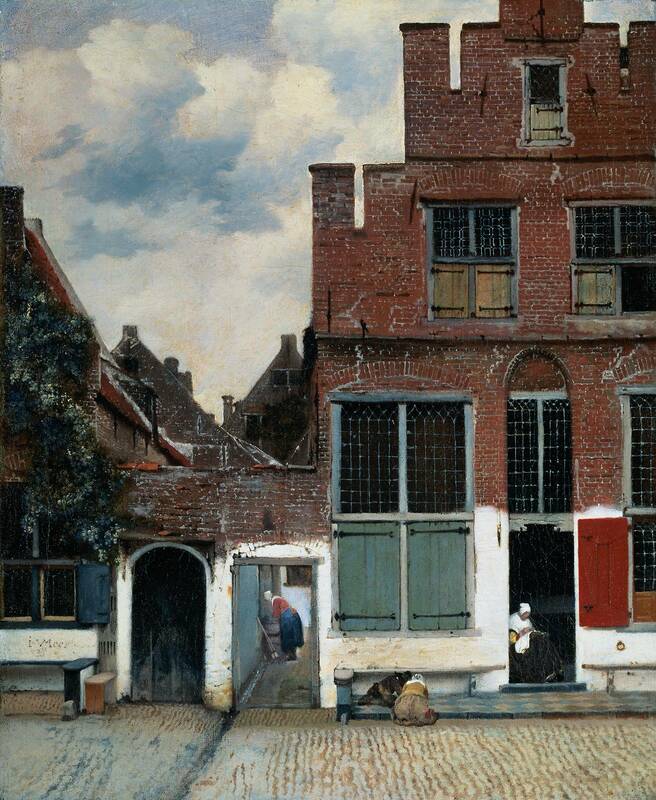 Vermeer painted his work entitled as The Little Street between 1657-1661, and is currently located in the Rijksmuseum, Amsterdam. According to the information available at the essential vermeer webpage, the support is a fine, plain weave linen, with a thread count of 14 x 14 per cm² The original tacking edges are present and marks from the original strainer bars are 3.5 cm. from the edge on all sides. Of the two lining canvases one is probably attached with glue/paste, the other with wax resin. What is most striking about this painting in particular is the amount of details that Vermeer included as to achieve a more realistic scene. Vermeer made it possible to achieve such realism due to the layering technique that he used in many of his works. Layering starts with an underpaint layer which covers the whole canvas so that it changes its white tone. Then it is necessary to form the basis for the main objects. These patches follow a dark to light order and once the layer dries, the edges of the patches are knitted together so that sharp details are included. It is interesting how Vermeer was able to create very life-like bricks, but he did not paint them one by one of course. What he did was to first paint a large brush a more or less uniform layer of reddish, almost brown, paint. Then he introduced in different places tinges of grey to avoid giving a mechanical aspect. 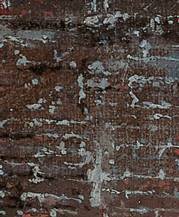 Once this layer dried, he defined the mortar between the bricks using a light grey colour. Finally, some bricks were brightened and others darkened so that a sense of relief was created. In all his paintings it is evident that Vermeer was very good with light and so we find here. The light coming from the sun to the left is reflected in the clouds so that we can see a brighter colour. The blue used here is blue azurite, the most common blue found in the palette of 17th century Dutch painters since it was cheaper that the blue pigment made from the lapis lazuli. However, in order to get a solid blue it was necessary to apply several coats of azurite and for holding the azurite pigment grains firmly in their place they used glue. The rows of cobblestones which slowly converge towards the vanishing point are essential to create that sense of depth. This is important because otherwise the painting would be all flat as the main building. 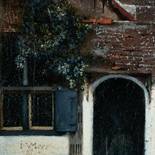 Moreover, Vermeer includes details that help create this sense of depth in the painting. There is a soapy water stream that runs down from the servant’s wash basin along the wall. Directly in front of the main building’s doorway is a shallow platform decorated with ceramic tiles. The effect of three dimensionality is heighthened by the maid washing. All the rows lead to this figure which we may consider one of the main focuses of the painting. 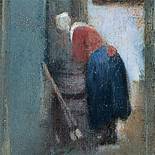 Here we can see a maid washing laundry over a wooden barrel at the end of an alleway. A boom stands nearby. In the end of the 17th century, sweeping and booms had solid associations with spiritual cleanliness and purity. In fact, the concept of domestic virtue was essential to the Christendom and Dutch nationhood. Infrared reflectography has showed that Vermeer had initially included a seated woman doing handwork at the entrance of the alleway. He later painted her out probably because she obstructed the passageway and ruined the effect of three dimensionality. The grape vines are closely related to the importance of domestic virtue mentioned before. Since Antiquity, vines have symbolized fidelity and marriage, and in this context domestic virtue. Vines could be seen in a great number of Dutch cityscapes through the Dutch light was so weak that the grapes failed to produce drinkable wine. The curious blue colour of the foliage has been attributed to the loss of a transparent yellow glaze painted over the blue leaves which originally would have given the leaves their proper green colour.